It struck me that in order to run trains from either oval to the station, and to be able to shunt the station while running trains on the main lines, the wiring for this train set was way beyond connecting a controller to each circuit! I decided I'd better allow for three controllers, even if two would suffice most of the time, which meant having to have rotary switches rather than just 2-way. I settled on 4 main sections that can be switched to any controller, and 7 sub-sections that allow locos to be isolated. Hopefully the control panels make this all clear, and it will allow enough flexibility in operation. I made up two control panels by printing out a schematic drawn in MS Word. These were mounted on some thick plastic sheet I'd picked up somewhere, then covered in sticky-back plastic (very Blue Peter!). I'd already drilled holes for the switches so they could be fitted, then I wired the switches to a loom ending in a screw terminal "choc-block" before fitting the panels to the layout. The panels are fitted into the side of the station board, the plywood being cut away to clear the switches and allow the wiring through. The Gaugemaster controller in the middle provides controllers A and B. With the screw connectors stuck in place (hot glue works well for this) wires are run to the relevant tracks on the layout, and the "temporary" connections of the two circuits to the controllers changed to the switched arrangement. Plus whatever other colours I had to hand for the controller feeds. Another block connects the panels to the controllers, and joins all the "common returns" which greatly simplifies the wiring. There is a sticky label by each terminal block with wire codes marked on. The DIN plug on the left is connecting the third controller (C) to a 5-pin DIN socket. As I've used the same socket as on my other (more serious) layouts, and connected the 16V AC from the Gaugemaster controller, I can use one of my usual hand-held controllers, such as this AMR example (left). However I've also wired a plug to the end of an old Hornby controller, which works surprisingly well. Either way the third controller can be used by someone outside the layout, so friends (and visiting grown ups) can operate without having to squeeze into the centre well. So after a little planning and careful wiring, I was pleased when the layout worked first time. Even better my Son is very happy, he got the hang of the somewhat complex control knobs quite quickly, and he enjoys running trains in and out of the station from the main line. He's also enjoying shunting the goods sidings! I'm a bit behind with the story of my son's train set, so let me finish the tale of track-laying. Of course it wasn't long after half-term I was being pestered to create the upper station. These are the tools I use: pliers and small hammer for the pins, the end-cutters and screwdriver are useful for levering out pins when required. The scalpel is for trimming sleepers and slicing off the "chairs" to let the rail joiners fit. The orange-handled cutters on the left are Xuron track cutters, for years I used a slitting disk in a mini-drill which is certainly effective but the trac cutters are quicker and quieter. A fine file is used to clean up the rail end. Talking of track pins, here's a comparison. At the centre are PECO pins, long and thin and frankly useless. They only really work with "Sundeala board" which is basically compressed paper, sags, disintegrates, and is generally useless as a baseboard top. Even then you need to drill the sleepers with a 0.5mm bit - never mind tedious you'll be forever breaking bits too! If you use set-track you'll find the pre-drilled holes too big. Also they often protrude through the baseboard, ready to slice fingers and knuckles! The bent pin tells it all - these area fast route to frustration. So for years I've preferred Hornby pins (top left), these are strong enough to be hammered into most baseboard surfaces (including ply) without a pre-drilled hole, and are a tight fit in set-track pin holes. They will go through a sleeper too, though pre-drilling is probably a better idea I rarely bother. The head is bigger and more visible, but when laying track on a "serious" layout I glue it, adding pins around the rails and sleepers to hold it, and pull them out afterwards. So many of these Hornby pins have been used several times already! When I was running low I popped into Gaugemaster (fortuitously quite local to us) to get more Hornby pins, but saw that Gaugemaster sell their own variant (GM66 if you are interested). These are very similar to the Hornby ones but with a flatter head, and you get more in a pack for similar money. They do a "PECO" style of pin too, but these shorter ones are the ones I'd recommend! Anyway here's the finished track layout, with platforms being fitted for the upper station. The next task was to wire it all up! 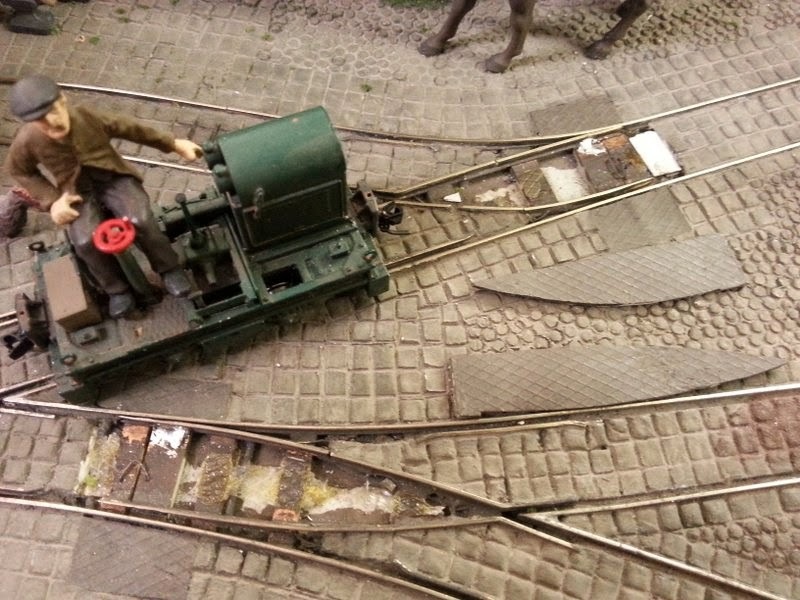 In-between train-set updates here's a quick post showing some maintenance on Landswood Park. The tight kick-back siding point had failed some time ago, which didn't matter that much as it was rarely used (little can get round the corner anyway). However when one of the other points failed it was time to do some repairs. Both had failed the same way - the soldered joint between the blades and the tie-bar, a common weak spot on hand-built points. Fortunately I had thought ahead when I built the layout and that part of the point was covered in plastic chequer-plate rather than set into clay setts. The plastic was simply eased off, exposing the joints that needed re-soldering. Once repairs were complete and tested, a little impact adhesive was used to secure the plastic back in place. The points on Thakeham Tiles were constructed with much more thought and have pivoted joints at the both ends of each blade, so shouldn't suffer this issue, but as Landswood Park is built in a box-file there was no space underneath the board for such tricks.